I asked Michiko Kakutani, author of "The Death of Truth," for her impressions. What does this moment mean for the court and the country? "Republican senators' eagerness to rush Kavanaugh's SCOTUS nomination through without a real investigation into the allegations of sexual assault against him is yet another case study in the toxic disregard for truth that has taken hold in Trump's Washington," she said. 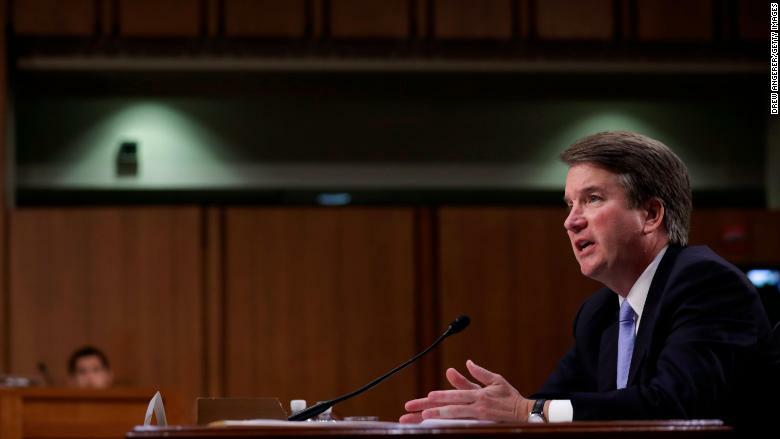 And "Kavanaugh's own statements -- about his school years, about his role in a controversial Bush-era judicial nomination, and his sycophantic remarks about President Trump -- suggest that he has a casual, if not troubled relationship with the truth. All this is a distressing mirror of the tribal politics and disdain for truth that has become a hallmark of the Trump era..."
Will people end up even more polarized, even further apart on perceptions of the truth? That's my wager. Laura Ingraham was on Fox just now complaining about Ford not handing over her therapy session notes: "There was no therapist! It's a big lie! Lie! Lie! Lie!" It's just going to get more and more heated. As Nate Silver tweeted: "I keep thinking about those studies where, the more evidence you show a committed partisan against their case, the more it entrenches their original viewpoint..."
"It's hard to imagine some of the female vote being more energized than it is right now pre-Kavanaugh," Bash said. "But if it is possible, [Kavanaugh being confirmed] will energize them more. The flip side of that -- because there is a ying to every yang in politics -- if Kavanaugh goes down, the Republican base, which is not very energized right now, will then be energized. They understand they've been waiting a generation to replace Anthony Kennedy..."
Every major player will be carrying the hearings live, including all the broadcast networks. Politico's Blake Hounshell summed it up in four words: "Trump can't help himself." Ashley Parker's WaPo recap: "For a president facing one of the most consequential weeks of his presidency — and fighting for his Supreme Court nominee's political life — Trump at times seemed blissfully unaware of the stakes, deeply enjoying himself as he bantered with his press corps..."
Michael Grynbaum's NYT piece about the prez and the press: "Trump made clear that he is never more comfortable, never more engaged, than when he is sparring with the news media that he loves to say he hates..."
ABC's Jon Karl: "Can you understand why a victim of sexual assault would not report it at the time? Don't you understand?" NBC's Hallie Jackson: "Has there ever been an instance when you've given the benefit of the doubt to a woman?" CNBC's Eamon Javers: "You made a significant allegation against the Chinese government, you suggested that the Chinese had meddled in, or are meddling in the 2018 midterm election. What evidence do you have of that, sir?" CBS's Steven Portnoy: "What messages do you have for the young men of America?" -- Check with Sean: "I was accused by -- I believe it was four women." (False.) "You can check with Sean Hannity, you can check with Fox because they covered it very strongly." -- Trump was crediting Hannity with covering the claims that "women were paid to say bad things about me." But in the next breath, he distanced himself from Hannity: "Believe it or not, I don't speak to him very much, but I respect him." -- CNN's Jim Acosta was the fourth male reporter to be called on, so he asked Trump to take a Q from a female colleague next. Trump did, though The Daily Beast's Matt Wilstein observed that he repeatedly interrupted and talked over female reporters. CBS's Weijia Jiang persisted when Trump tried to cut her off, and asked how the accusations against him "impact your opinions on the allegations against Judge Kavanaugh..."
-- Trump's love for the NYT shone through. He called it "failing" and said it was "a paper I once loved," but then a few minutes later, he admitted, "I still love the paper." -- When the NYT's Mark Landler told him "We're kind of thriving, not failing these days," Trump said, "You're doing very well. Say thank you, Mr. Trump." Landler, politely: "I think I'll stop short of that." -- When Hannah Thomas-Peter said she was from Sky News, Trump said, "Congratulations on the purchase..."
Trump keeps saying that he won the women's vote in 2016. He's been saying this for more than six months. "52% of women," he said again Wednesday. Well, he won 52% of white women voters, and 52% of men, but only 41% of all women voters. The first time he said this, it might've been a mistake. But now? After he's repeated it over and over?! Earlier this year George Mason professor James Pfiffner wrote "Trump's lies corrode democracy" for Brookings... On Wednesday evening, he told me, "Trump's lies are often an assertion of power. He expects others to agree with, go along with or repeat his lies. This demonstrates their loyalty to him, especially if it evident to most people that he and they are lying..."